Last year I had spotted Wild Planet products in a magazine. I did blog about my discovery but had not got around to trying anything from the range. Imagine my surprise when I get an email asking if I would consider reviewing a product. 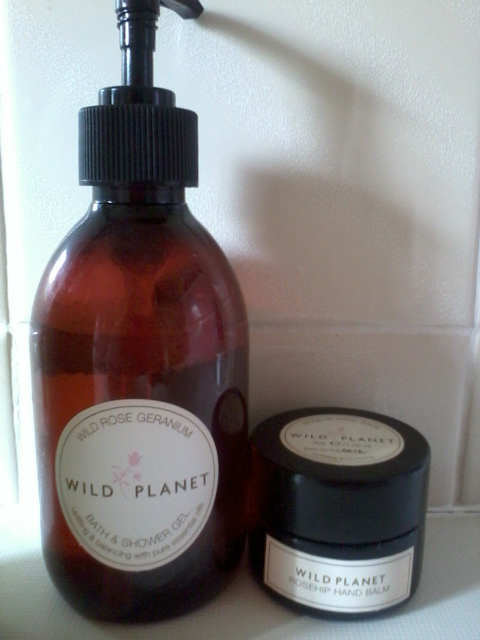 Of course I accepted and a few days later the postman delivered Wild Rose Geranium Bath & Shower Gel and Rosehip Hand Balm. Wild Planet products are handmade in the UK using natural and organic ingredients. They are free from sodium lauryl/laureth sulphates, parabens, petroleum derivatives or any artificial colours and fragrances. Packaging is recyclable. The shower gel has a beautiful aroma. If you are familiar with rose geranium essential oil you will appreciate the pleasant floral scent. The gel is a nice consistency, easy to dispense from the pump (PET) bottle and creates a good lather. I have not experienced any irritation and my skin feels soft and free of dry patches. I do love the look and feel of the bottle. You can proudly display this in your bathroom. A 250ml bottle costs £12.95. The hand balm is described as “An intensive balm with organic anti-aging rosehip oil to help repair and renew while the rose-infused sunflower oil will help hydrate and nourish. Blended with organic rose geranium essential oil”. It has a beautiful aroma. You can tell the product contains natural fragrance because it is a real pleasure to breathe in the scent. Unlike other hand creams I have, this is a solid balm which you need to scoop from the jar and massage into your skin. I am surprised that it is not overly greasy and absorbs easily. The balm is packaged in a glass jar which is not ideal for your handbag so best left on the bedside table. Personally I can see this balm getting more use during the winter months when my hands are at their driest. Saying that I am happy to use in warmer weather but I require it less often because it leaves a lasting effect. My hands do feel soft and supple after using this balm. It is a luxurious product and I think it is best when you have a spare five minutes to pamper yourself. It is excellent value for money (£8.95) as a small amount goes a long way. Overall, Wild Planet gets thumbs up from me. These are luxury products which are affordable and make beautiful gifts. I recommend you check out the website and browse the other products available.